A lot of people don't like cows. 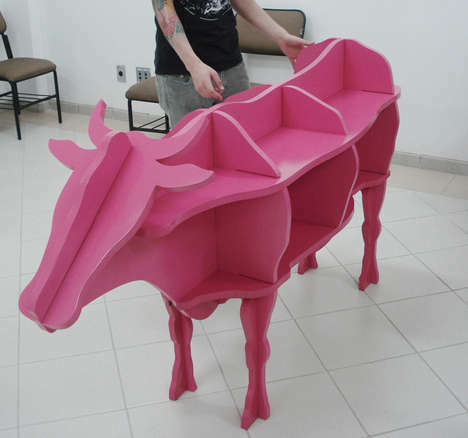 In fact, many would claim to actively dislike cows (T.S. Eliot was particularly virulent in his hatred of them; see here). I'm not one of those people. In fact, I'm rather fond of them. It may have something to do with the cuteness of my country's native cows (seen here). Also, spending more than an hour with a friendly herd in a field trying to get a good photo for a personal project probably had something to do with it (was v. difficult, actually, only decent result was this - but still pretty, no?). I know, I'm odd. 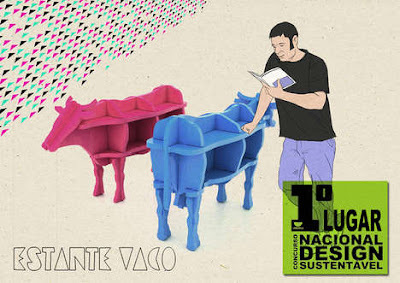 Anyway, I like cows, and I also like bookshelves, so it was only natural that I like something that combines the two - which would be this Estante Vaco bookshelf design. So ridiculous, yet so fun. I don't think these are for sale, but the design did trot off with the blue ribbon at a sustainable design competition, so that's pretty impressive. I think this would be so cute in a kids' bedroom or playroom. It's low to the ground, brightly coloured, and animal-themed!